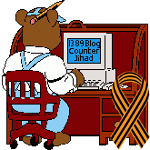 satire — 1389 Blog - Counterjihad! Trading Private Bergdahl: MAD Magazine nails it! I respectfully disagree: It wasn’t God who made liberals. How’s it workin’ out for you?